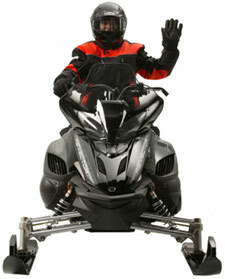 Hand signals are easy to use and can be a very reliable way to communicate while riding a snowmobile. 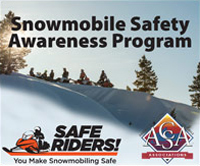 They can be vital to safe snowmobile riding, so always make clear, very deliberate signals with your left arm that can be seen by other drivers behind you or on approaching sleds. 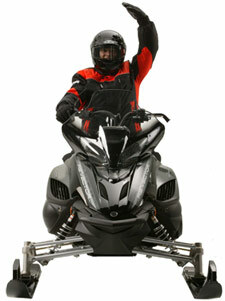 Left arm is raised from the shoulder and extended straight up over the head with palm of hand flat. Note that some riders may be indicate the STOP signal by extending their right arm instead of their left since the left hand is used for braking; therefore watch for and be prepared to stop for either signal. 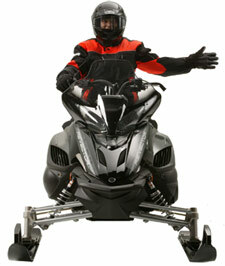 Left arm extended straight out from the shoulder to point in the direction of the turn. Bend your left arm at the elbow to shoulder height; with your hand pointing straight up and your palm flat, your arm should make a right angle. 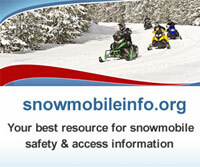 Guide your snowmobile to the right while pointing to the right side of trail over your head, signaling to riders behind you that they should make sure they are riding on the right half of the trail and are yielding to on-coming traffic. 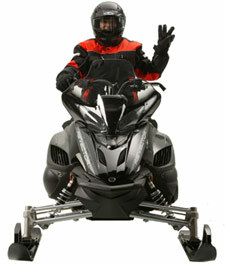 Left arm is raised with elbow bent; with thumb pointing backward in hitchhiking motion, move arm forward to backward over your shoulder to advise approaching riders there are other sleds behind you in your group. Note that many riders may instead raise a number of spread fingers to indicate how many sleds are following in their group (if five or more, simply hold all five fingers up with fingers spread, or flash multiples of five). 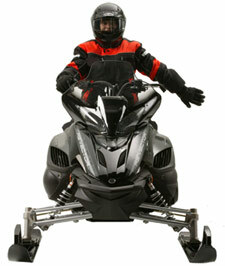 If traffic is heavy or if you're riding in the middle of a large group that is spaced fairly close together (next sled is clearly visible directly behind your sled), it is best to keep both hands on the handlebars and concentrate on driving your own snowmobile versus worrying about this signal since it should be quite obvious that other sleds are following. 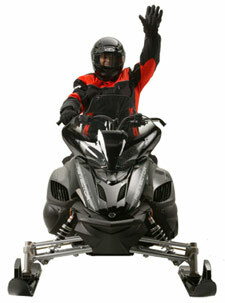 Left arm is raised at shoulder height, elbow bent and forearm vertical with hand clenched in a fist; important signal used to advise approaching riders that you are the last sled in your group.